Lately when I want to have a tasty and healthy lunch at home, I make a yummy Asian style chopped chicken salad. I use this recipe as a base with a few alterations. I add about 2 cups of cooked chicken and 1/2 a small head of cabbage (chopped) for more protein and to make the salad go farther. I love that it's simple enough that it can be thrown together pretty quickly and makes enough to have for a few days or would be a great salad to share with friends for a lunch date "in". Ever get the feeling that you need a new recipe cause you're going through a recipe rut? You know, cooking the same old things that are your favorites, but not really that exciting? This has far too often been the case for me lately! With it being summer and sometimes hotter than you know what, I was on the hunt for new "summer" recipes that would be light and refreshing. My latest Food Network magazine came to my rescue the other week to help cure this recipe rut and provided a light summer side dish for our dinner! Their "mix and match" article was on bread salad, so I decided to give it a go. I like these mix & match articles/recipes because it gives you a basic recipe to go on, but gives you many ideas and lets you feel like you are creating your own custom recipe. 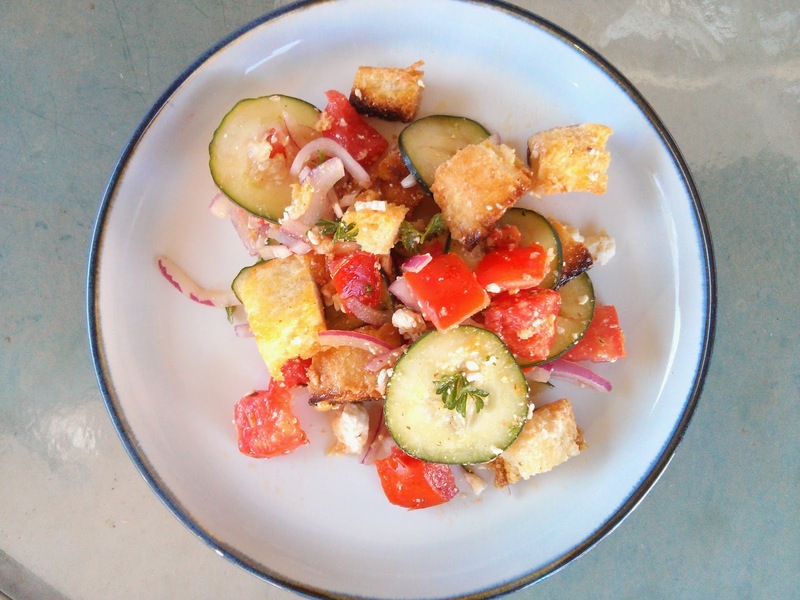 or family over and enjoy this simple summer salad! My oh my, it's been quite some time since I've been on here. I'll skip apologies and say, I was in my last trimester of pregnancy when I last blogged and now I am a mom! Seven weeks ago Clint and I welcomed our baby girl, Laura-Jean (full first name). She is such a sweetie and we are so blessed to have her as our little girl. As part of our preparation for her joining our family and home, we had to make space for her and naturally I was super excited about decorating her bedroom. I decided to go with a vintage/shabby chic theme since a baby girl's room is the only room in the house I felt I could make really feminine and of course I love all things vintage. 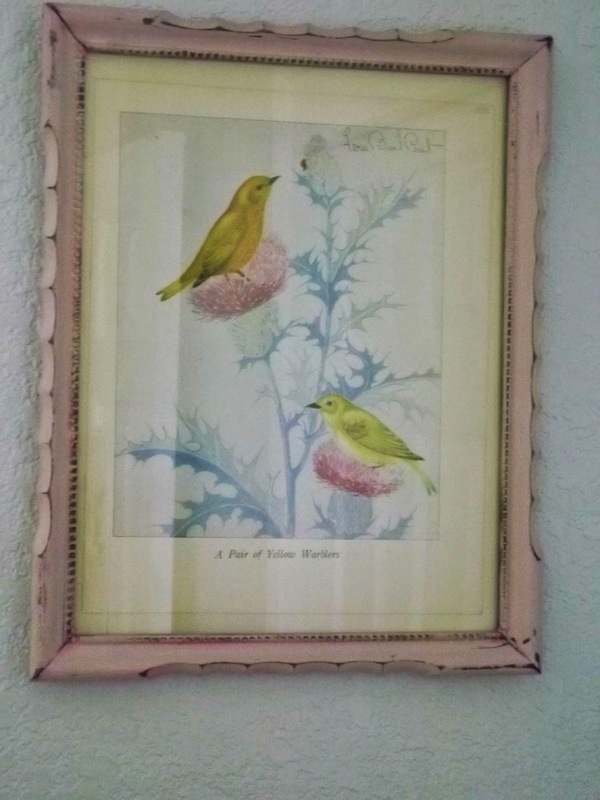 This vintage print and pretty pink frame were some of the first items that I found when I decided on the style for Laura-Jean's room. 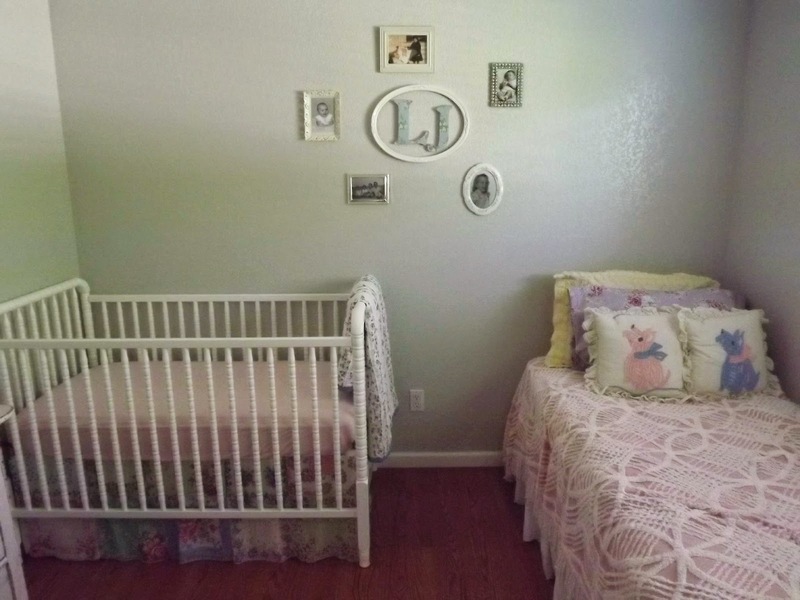 There is a twin bed beside Laura-Jean's crib which is a perfect place for visiting grandma's to get comfy. One of my favorite parts of her room is the personalized photo wall. Flanking her framed initials are photos of Laura-Jean's grandmas and grandpas! From the top going clockwise the photos are of: her great-great grandma Laura, her Pop Pop (grandpa Lyle, my dad), her Nana Laurie (my mom, which is where her first name comes from, her grandpa Steve and his brothers (Clint's dad and uncles), and her grandma Jackie (Clint's mom and where her middle name Marie comes from). The bedskirt for her crib is made out of vintage handkerchiefs! 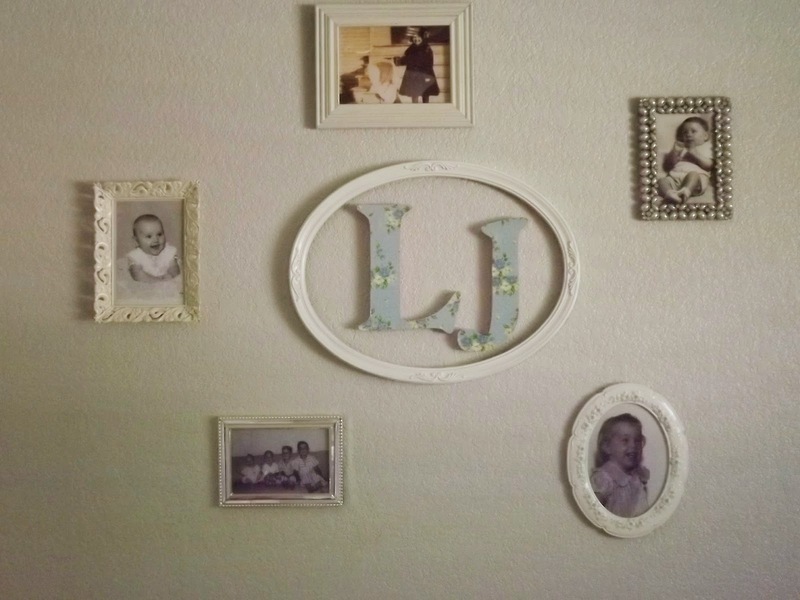 I loved this idea, but buying one already made was expensive and didn't completely match the room so my mom made one! 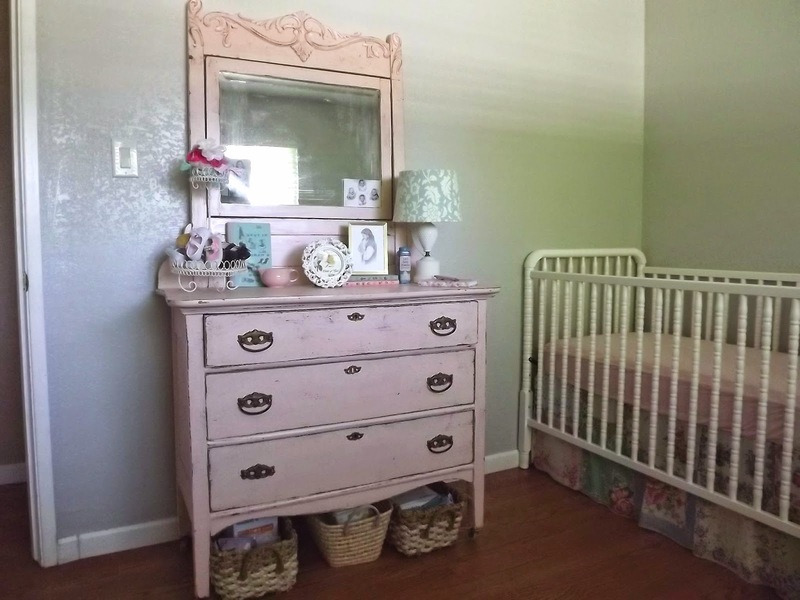 Perhaps my favorite part of her room is the pink dresser that houses her clothes and adorable little accessories. After hunting for a dresser for several weeks I found the perfect one at my favorite local vintage market. This white wire tower was also bought at the local vintage market and displays a few of Laura-Jean's shoes and headbands. So there you have it, a little tour of the space we get to enjoy our baby girl in! Tomorrow is the day of love, Valentine's day! There's a couple of simple things I've done this last week to spread the love to family and friends. 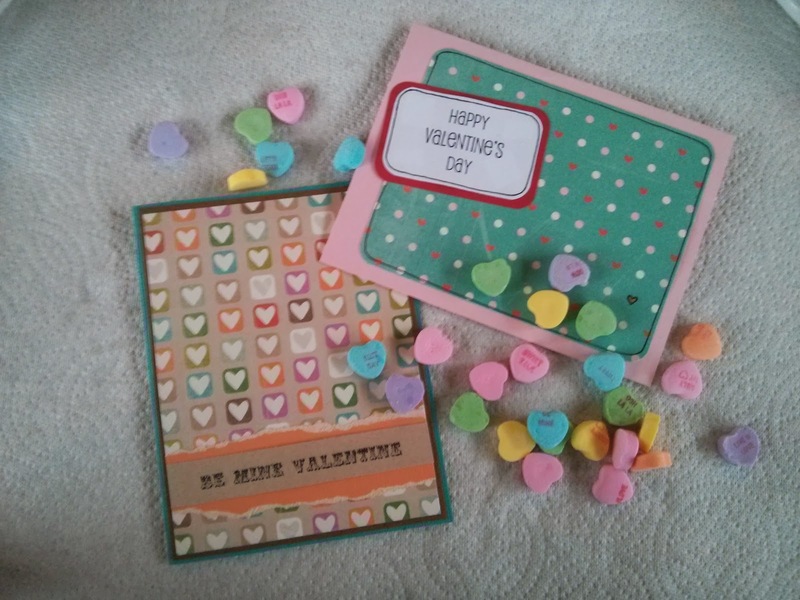 I handmade Valentine cards to send off to family and friends near and far. Even if our loved ones aren't close, we want them to know that we heart them! 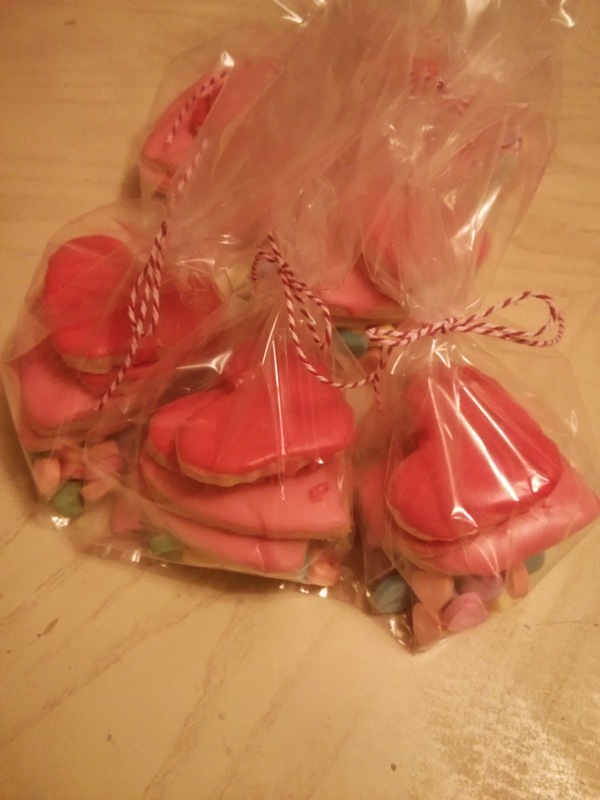 For a couple of friends close by, I made heart sugar cookies to let them know I'm sweet for them. So what are you doing this Valentine's day to spread the love? A little delayed, as we're 2 1/2 weeks into the new year, but I figured I'd catch up on what I'm up to now that the holidays have passed and 2014 is in full swing and I finally have a chance to slow down (by force, not by choice, thanks to coming down with a cold this week). I'm trying this year--well at least this month-- to make almost a full month dinner list so I can spend less time at the grocery store. So far, this plan has worked out great! While it required a bit of time to get a meal calendar planned out and long grocery list together, I think it truly has saved me time since I haven't done my major grocery shopping since New Years day! And, I still have a weeks worth of dinners planned (with the groceries for the dinners too). Of course with the calendar, we have some flexibility and if we end up not eating one of the meals that is on the schedule, I just mark it down at the bottom of the calendar to be made on a later night. After New Years we moved everything out of our home office and our guest room and made a switch! 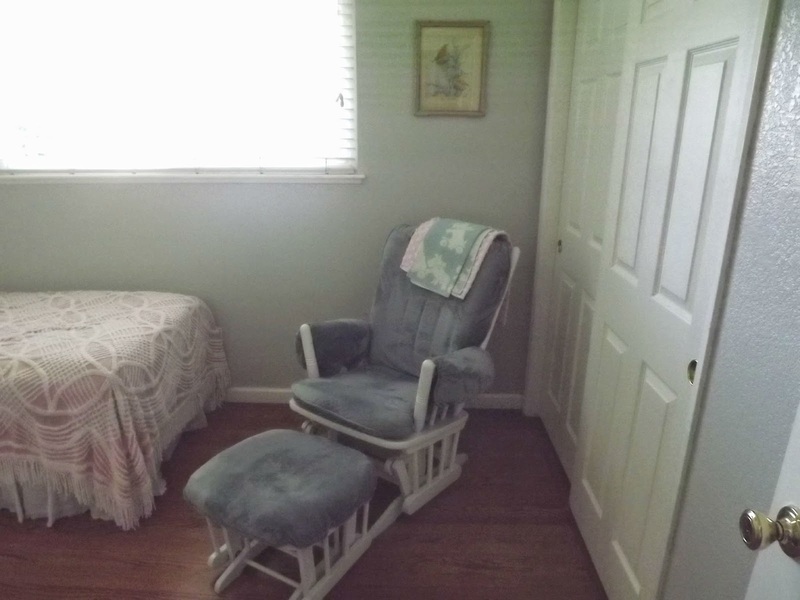 The smaller previous guest room is now the office and the previous office which is the larger of the two rooms is blank and ready to be painted. This room is getting ready to be the baby room! No progress has been made as of yet, other than clearing out the room and prepping it for painting, but I'm hoping in just a few short weeks the room will be ready to welcome our baby girl that is coming this Spring. Once the room is done I'm sure I will share, but for now it is just a blank slate. I hope to have more fun crafty and cooking things on the blog this year, so stay tuned! Can you believe Christmas is only 10 days away! How did that happen?! The month has gone by so fast and I have to admit I haven't done all the Christmas stuff I would like to do (like getting lights hung on the outside of our house), but I was able to do a little craft to add to the Christmas décor at our house before the month flew by. 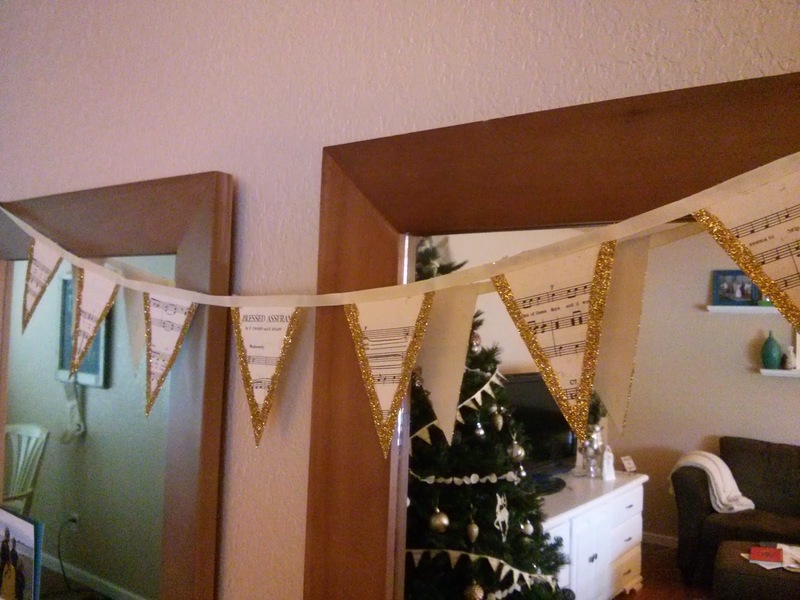 I've had some vintage music sheets in my craft stash for a while and finally decided to do something with them. I just needed a little ribbon and glitter from the craft store and a few other tools I already had on hand to make banners! I first made a mini banner to drape across the Christmas tree. I then made a banner that was a little bit bigger to hang in the living room and add a little extra shine to our entry mirrors. It's just a little craft, but cost only a few dollars and I think adds some great sparkle and vintage style to our Christmas. 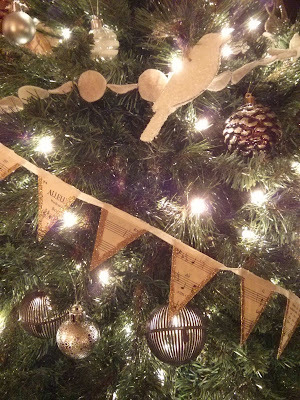 Have you done any crafts this Christmas season to add a little shine to your home? 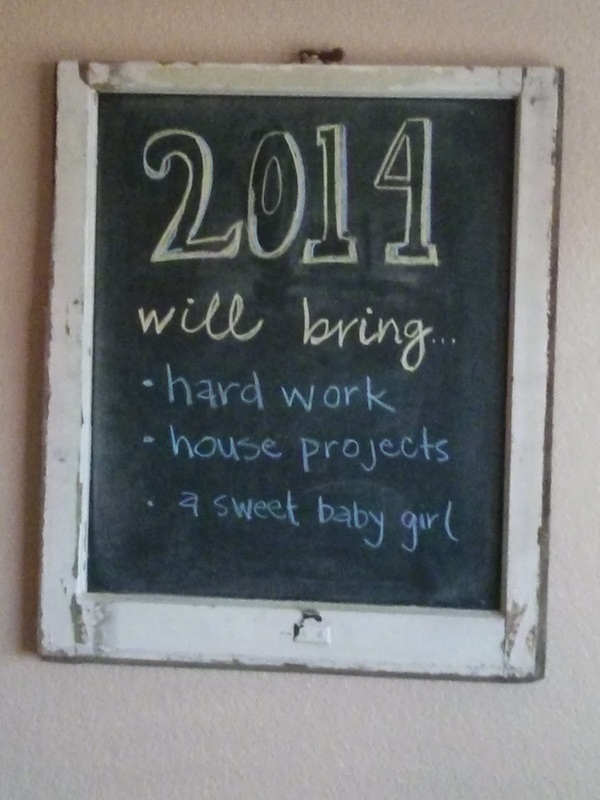 There's some exciting stuff going on at our home these days...we're getting ready for a baby! That's right, we're expecting our first baby in April! Throughout the last two months we've slowly been breaking the news to family, friends, and co-workers so it seemed like it was finally time to make the announcement to the masses. Of course the first people we told were our parents. We told my parents over a game of Scrabble, which is a family favorite game to play together. Our first ultrasound of the baby made me say, "we're having a gummy bear!" since the ultrasound looked less like a baby and more like a little gummy bear in my belly. 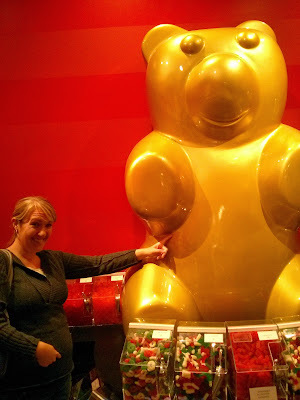 So, for about the first month we called the baby our gummy bear. It was fitting when I saw this huge gummy bear at a store in the mall to take a picture of it with my "gummy bear". And just this week we found out that we're having a girl! It felt like Christmas that day being able to see an ultrasound of a cute little baby and finding out we're going to have a little girl this Spring! Our pictures for our Christmas cards this year catch our growing baby girl (aka my growing belly). So, that's a little update on the big change that is going on with our family as well as the reason I've been slacking a little with blogging in the past couple of months! Vintage Yellow House on Etsy! I'm a hand-me-down homemaker. I've learned a few tricks of the trade--from decorating, crafting, entertaining and cooking--from the women in my life that inspire me. Now's my turn to share! Services...what can I do for you?! Need help with cooking, decorating or planning for an event? Stuck on what to do with your bedroom, living room or any space in your home?